Is the natural wine movement a form of luddism? I had my introduction to the natural wine movement recently at The Festival at Basket Range nestled in the Adelaide Hills. For me it was a fun day out but I must say that most of the wines were not to my taste. 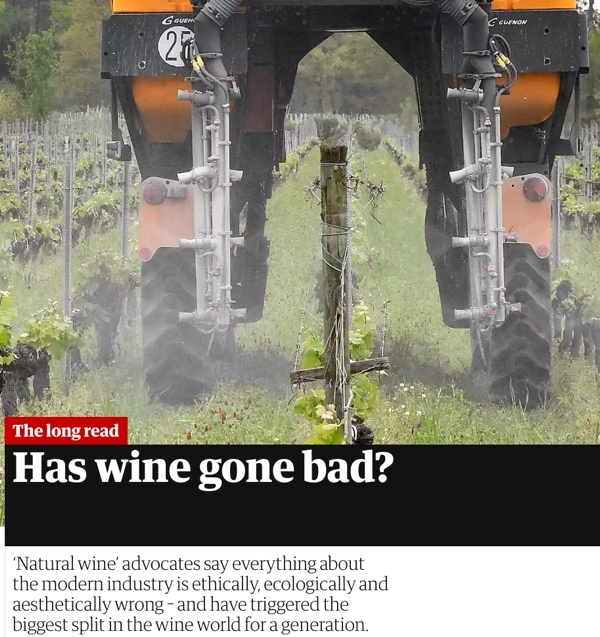 I find myself in the category, described today in The Guardian, who think the natural wine movement is "a form of luddism, a sort of viticultural anti-vax movement that lauds the cidery, vinegary faults that science has spent the past century painstakingly eradicating." But each to his or her own and there were many at the Festival jovially downing wines I chose to spit out. And as the article in The Guardian points out, "the rise of natural wine has seen these unusual bottles become a staple at many of the world’s most acclaimed restaurants – Noma, Mugaritz in San Sebastian, Hibiscus in London – championed by sommeliers who believe that traditional wines have become too processed, and out of step with a food culture that prizes all things local." Whatever you think, the article makes an interesting read.